Note: Add classic 2,3,4 checkboxes have been moved to the bottom of the Settings Page. It is Best to use Ip addresses If possible. If a Classic Answers, the 4 Device Box's below the test button will be filled in. If The Classic is not found. You will also see a error at the bottom of settings window, with some explanation. At this point you will need to Check, network Settings or Make sure no other program is Connected to the Classic, check firewall, etc. .
"Name" will be filled in with name that is programmed in Classic after pressing Test Classic (x) Tcp / Ip, This Can be changed if you wish this only effects the name displayed on the main page. It dose not change the Classics's Name. "Time-out" normally Is ok at 10 sec. If you have a slow connection and get connection errors it may need to be lengthened . "Write PW" = Password for writing values To the Classic it is used in the "Advanced Settings" and " Device Control" Sections of the program. Enter the Serial Number of Classic without leading zero's. This may be left blank if you do not plan on changing any settings on the Classic. "Check Boxes" Select the check boxes of the items you wish to be Displayed on the Main Window. Do NOT Check "Add Outback AXS" Or "Add Second Classic" at this Time. "Show_Total Watts" is only Checked if Monitoring more than one Classic it add a Total Watts field to the Main Window, witch will contain the Combined wattage of all Classic's being monitored. "UpDate Time In minuets = Time in minuets between refreshing Data from Devices. ( .2 min (12 sec)) To 30 min Max), Recommend .3 To 5 min. If using Auto Controls Functions to Control Outback AXS set to no more than 2 min. Then come back to "Basic Settings" to make Changes Or Add more Devices One at A Time. Note : You Can Not Access The Outback AXS Or Conext XW Inverter Until you Have Successfully Connected To a Classic Charge Controller At Least Once with This Program. Select "Add Outback AXS" Check box at the bottom of Settings Page. A new form for Outback AXS settings will appear. Click Test AXS Tcp / Ip The Program will Look for a AXS at the Address and Port. If NO AXS is found There maybe A long delay. If a AXS Answers, the 5 Device Box's below the test button will be filled in. The bottom box will show FX Or GS Inverter if Detected. If The AXS is not found. You will also see a error at the bottom of settings window, with some explain. At this point you will need to Check, network Settings or Make sure no other program is Connected to the AXS, check firewall, etc. .
"Name" will be filled in with name that is programed in The AXS after pressing Test AXS (x) Tcp / Ip, This Can be changed if you wish this only effects the name displayed on the main page. It dose not change the AXS's Name. Feild "Check Boxes" Select the check boxes of the items you wish to be Displayed on the Main Window, Ac_in V, State, Warnings, Errors, ect. XW and a SW Inverter Can not be connected on the same ComBox. 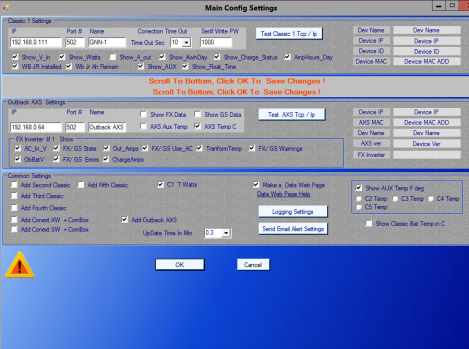 Note : You Can Not Access The Conext ComBox Until you Have Successfully Connected To a Classic Charge Controller At Least Once with This Program. Select "Add XW + ComBox" Check box at the bottom of Settings Page. Select "Add SW + ComBox" Check box at the bottom of Settings Page. 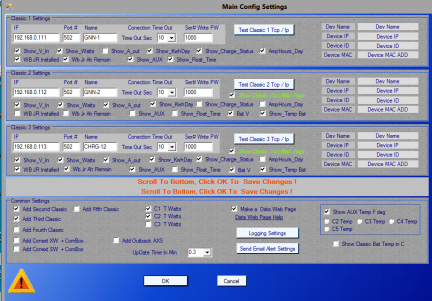 A new form for ComBox settings will appear. Click Test ComBox The Program will Look for a ComBox at the Address and Port. If NO ComBox is found There maybe A long delay. If a ComBox Answers, the Box's to the Right of test button will be filled in. If The ComBox is not found. At this point you will need to Check, network Settings and ComBox Settings, Modbus Addresses, check firewall, etc. .
"Name" will be filled in with name that is programed in The ComBox after pressing Test ComBox (x) Tcp / Ip, This Can be changed if you wish this only effects the name displayed on the main page. It dose not change the ComBox's Name. Field "Check Boxes" Select the check boxes of the items you wish to be Displayed on the Main Window, Ac_in V, State, Warnings, Errors, ect. A new form for Second Classic settings will appear. 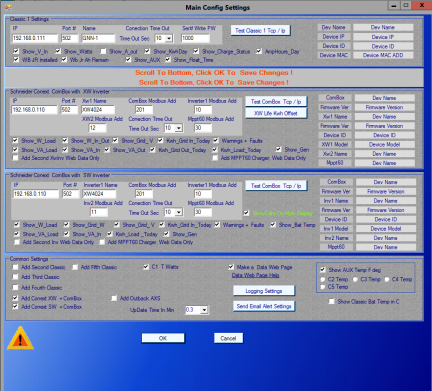 Follow steps as as shown in Classic 1 Settings. For Third & Forth Classic Same as above.